Website about Mars, Physics, anomalies and mysteries. The image below is a colored fragment of Viking orbiter's frame 035A72, a snapshot of the martian landscape taken in 1976. 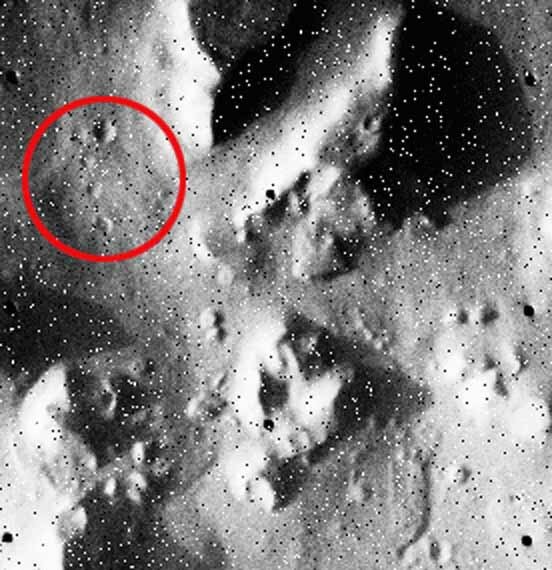 A red hue has been added to the original gray-scale image, and some of the mounds appearing there have been labeled. The image have been re-scaled and rotated. The colored segments of line join these mounds. The scale of the image is of about 17 km X 20 km. The image was not ortho-rectified, and the direction of the lines was adjusted by hand. Diagram of symmetry. Parallel and perpendicular relationships among six mounds in Mars. Origin of frame: photograph 035A72, Viking Orbiter A. NASA, 1976. © 1997 Cesar Sirvent. Diagram of Symmetry Cydonia Mars by Cesar Sirvent is licensed under a Creative Commons Reconocimiento-NoComercial-SinObraDerivada 4.0 Internacional License. Creado a partir de la obra en http://www.thequantummachine.com. Notice the extremely curious bidimensional arrangement of the 6 mounds labelled. They were chosen for being the mounds with highest albedo in the entire photograph. They are a subset of at least 6 more mounds, which also show a peculiar arrangement. However, these six labelled mounds form an isolated subset, with an intriguing geometrical disposition. The colored lines represent the geometrical relationships among the mounds. Lines of the same color represent parallel lines. Also notice that the white line is perpendicular to the green lines. Also take into account the remaining perpendicular relationships among the depicted lines. It should be clearly stressed that the mounds had been noticed as geometrically ordered by Crater and McDaniel(1994). It was just in 1996-1997 that, when measuring distances among these very same mouds, I found the parallel-perpendicular relationships, which strike me as more basic than the triangle-based model of Crater-McDaniel. In any case, the mounds and geometrical model are identical in both interpretations, but I see the parallelism interpretation as more shocking, at least to the eye. The acuracy of the real positions of the mounds respect to the geometrical model is very high (precission up to the level of 1-2 pixels in average. The highest deviation is of around 3.5 pixels, quite noticeable for the mound P in the by-hand adjustment). Computer simulations (as well as heuristic method using pixel areas) show that the chances of the mounds being ordered "just by chance" (without an underlaying cause or origin) is less than 1 in 200,000,000,000. The question remains open of what (known or not-yet-known) geological mechanisms can account for such order. Till date, no geologist have come with a model. Notice also that a "perfect" fit would lower the chances so much that a statistical analysis would not be necessary. Also that this is an "aerial" photograph, we don't know if the fit would be stronger in "ground" measurements having into account the orography of the terrain. Caution note: The methodology and results of the mounds research have been criticized (see rebuttals below). It is my opinion that most of this criticism arises from the possible conclusions that may be extracted about intentional design in the distribution of mounds. I personally don't believe such conclusions are logically derived from the results, and the hypothesis which is presented is merely that the spatial distribution is not random, i.e., that the mounds are not independent each other. An example of an obvious non-random alignment quite similar in properties to the mounds distribution is the crater chain at the bottom of the page. They are likely created from a disrupted meteoritic body. No critic would object that the craters are independent each other (random).I claim the same for the set of mounds.